00.. 1...0.9.O .e. e e... 909 9090900e e ..0. Wheat....*. ... ......*. *..... .
: .. 1ASHIIIGTO', D. C.
and sugar cane for sugar appear in the issue of Crop Production dated ">.y 10, 1050.
and eggs, milk, and meat animals wore issuCd in .pril. 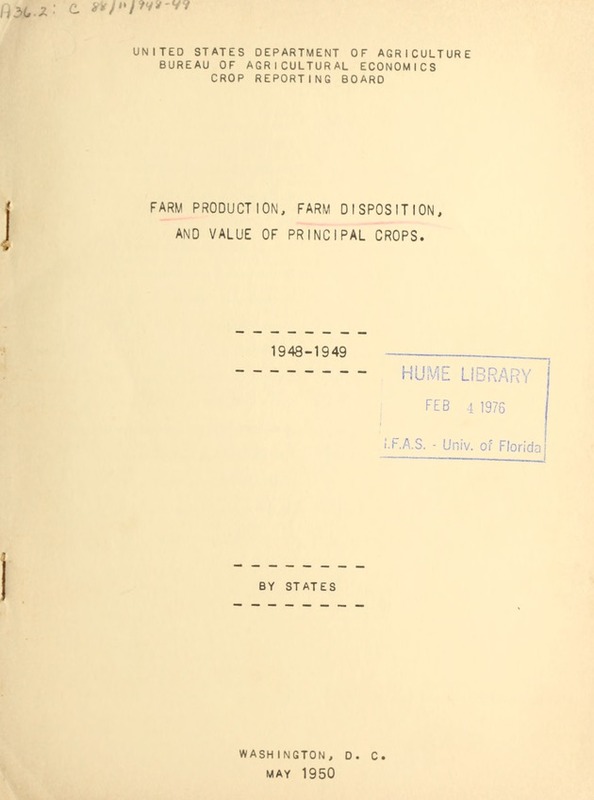 data on individual crops, as reported in responses to special disposition inquiries. by rail, boats and trucks. marketing season. The marketing season is shown below the table for ca.ch crop. significant volume. Footnotes designate the years affected for each commodity.
" of home consumption are computed by applying the season average price to the quantity. 18,447 2,098 1,678 2,952 41 . 7,393 761 533 887 1 . 39,270 2,975 2,440 7,461 53'". 50,391 4,847 4,071 2,016. 20 4. 986 122 104 168 6 1 . 9,194 760 646 2,298 690 . 5,184 588 429 1,037 165 . 5,365 425 361 1,073 465. 308 22 15 154 5 . 525 52 13 289 2 . -6,1605 3,348 2,511 2,584 20 . 3,487 395 276 523 4 . 29,954 1,508 1,056 1,797 3 . The values shown arc for the T.rkoting season or crop yoar and should not be..
S: seed : livestockk moxohanjod for flour:. 19-8 and 1949 / CROSM. 70 ..: .'.. : price pnor bu, : Vau alu T of what T' Value. : 1948 99 199' 198 1949 a _148 a 1949 a _1948 a"
The values shown are for the marketing season or crop year and should not be. confused wi*h.'iia. . . ...... .......,'.,'.i.. .... .. .
State for all Feed and tFor farmr. -LUJgS, BY SrTi S 1930 P "
S.t a teng .season or crop year and should not be confused with calendar year income. -OI&P. PRODUCTIONE. ARM DISPSIT101- -A A _. ProdUction: : F or S avj price I .Va.e2 : .- ,:. ~: 8: seed I hold o : s farmers Iproductions house. s saleSt,'F. Thousand bushels Dollar Thousand dollars ". Meo. 462 460 1 1 1.65 762 2 . N.H. 528 525 1 2 1.55 818 2. Pa. 64,077 54,052 77 9,948 1.35 86,504 104" 13v,344. Ill. 518,112. 270,543 33. 247 536 1.20 621,734 40 297,0.,0:::-. Mich, 85,920. 71,331 10. 14,579 1.20 103,104l 12 17,495 3.? Iowa 553,847 399,636 18. 154,193 1.25 692,309 22 192.7"! Va. 53,580 41,386 1,254- 10 940. 1.35 72,333 1,693 14,76. Ariz. 42Q 26.9 100 51 1.85 777 1S5 9..
Oreg. 1,095 1,036 59 1.55 1,617 .
deliveries valued at the average loan. rat? r bushel, Tb States. ^--" _.L_ _farmers_2 rdu--- -_ -es_. Mich. 5,6,700 48,195 8,505 .65 36,855 5,528 W"
Idaho 7,470 4,706 2,7.64 .72 5,378 1,990 /. Ariz. 330 129 201 .90 297 181 . Wash. 6,815 3,885 2,930 .80 5,452 2,344 .
chase agreement deliveries valued rtt the aver:..g loan rate" p'-r bushel, by States. U.S. 315-894 1 27,74. 188,180 1.16 33.6!8 -217. 6.
deliveries veluod at the avera;-e loan rate per bushel, by States. confused with c:.lend- r year income. c~uf, J~lio. ^i.1- -^'2 _- -n -^*r1 A2*2.
deliveries valued at the average loan riate per bushel, by States. : seed :For seed: Fed to :home use or exchanged..,. - - - - I.
to June 30 for all other States. The values shovm are for the marketing season or crop year and should not be ',"
The crop nmarketing season is September 1 to Aurust 31.
deliveries valued at the avar.p-; loan ra.te per bushel, lby States. to June 30 for all other StPtes. a Farm Dispjoition I, Season av, ae .Vl. SProduction : Feed: a. price pe 'bus.s Value'H i s.."
SORGHUI GRAIN: PRODUCTION, FAME DISPOSITIOII, AND VALUE, Ef STATES, 1949 CROP . S.Dak. 120 72 48 1.10 132 ..
Nebr. 1,592 509 1,083 1.20 1,910 1,0.
for Louisiana, Oklahoma, and California; October 1 to September 30 for all other .,i. for quantities of unredeemed loans and purchase agreement deliveries. loan rate per bushel, by States. The crop mae:keting season is September 1 to August 31.
valued at the average loan rate per bushel, by States. : : :. _Usnda 6am .fahr grarown Season : Value of. ',i. t for For to S farm 'Sold 'per bu. : of S house-. :seed. i seed live. : household I reld.;produoe. : hold. 0 1:i.
St s ?stock; use by tion Z use . fusod with calendar year income. -~ -' Att 9 .
:price'per lb. : production : picked and. for seed. and in duplicated under ?"Soldh. 1/ Preliminary. "2 Mostly hogged. _ 3/ Practically none sold from farms. fused w-ith calendar year income. California farms is 150,000 bushels'In 1948 and 170,000 bushels in 1949. Oct. 1 to Sent. 30 for California. :seed : hold. ; .roc-d. spro"- tITosc-- g. ii! The crop mr.rkcting sc-.son is Scptzmbcr I to August 31. " Z_ j Not including culls sold. deliveries valued at the aver,-;e loan rate per 100 pounds, by States. S The crop marketing season is July 1 to June 30.
year and should not bo 00010 4,. HAY: PF.ODUCTIOU1, FARi DISPOSITION, AN"D VALIT, BY STATES,.l..
: A _Farm Disnosition __:.Season average;." V-alue- . State Productiono Kept on price per ton a Value of "' Va.l. .
lMie. 880 805 75 27.80 ?4,464 2,05"
1.H. 445 405 40 29.00 12,905 1,16? Ill. 3,544 3,172 372 23.90 84,702 8,891. .
Mich. 5,606 3,227 379 21.40 77,168 8,111 ..
Iowa 3,913 3,639 274 22.40 87,651 6,138 . N.Dah. 2,962 2,844 118 14.80 43,838 1,i 46. Nebr. 4,230 3,722 508 20.50 86,715 10,414. McI. 641 577 64 25.70 16,474 1,645 ! Va. 1,823 1,653 170 30.00 .54,690 5,100 . Wyo. 1,018 896 122 27.70 28,199 .3, 79 ,. Colo. 2,375 1,781 594 22.4,' 53,200 13,306' a..
States; June 1 to May 31 in the Northern States. RDL 0LOv'-R SEED: PRODTUTCTCiT, -FARMI DISPOSITI0OI?7, ATD VALUE, BY STATES, 1949 0. 1. 60,000 28,800 31,200 23.70 1,422 :! aho 174,000 5,200 168,800 24.20 4,333 4,. Arit?., and Calif,; Sept, 1 to Aug.w, 31 for all other States, The value, rhoir. Thousand pounds Dollars Thousand d'c. nd. 5,000 800 4,200 7.40 370 ! kla. 6,200 700 5.500 8.70 539 4? 200 24,900 3719300 16.80 6,679 6.
i :Usod for seed- t price per g Value Valae..
State Production a on farms a Sold a bu. rec'd. a of a of:- ""
MinnZ 30,000 2,700 27,300 15.90 477 4- 34! Iowa 6,000 2,100 5,900 18.20 109 '.:? :"
marketing season or crop year and should not be confused with calendar year income.".. J .....,... ., .... .
-..::, :",, ; . :,, 24.
season or crop year and should not be confused with calendar year income. a :s Season aLveragea .. .a. Iowa 336 1 320 2.00 672 . Te_.- !o 210 10 110 i50 _315_ . ,a use toll) / -. -- - -----------a. . . .
S/ December 1 price except for Lduisioana. r.. !. .:i. : %... :. Sfarm Sold. : per g'. L L_- -_ 182 .1.258___ _- 4 . .tIS PtATOES P CTIO, 1At 'DISPOSITION, AND VALUE, BY STATES, 1948 CI. ---- ver --- . *- -. -v' -- -.". Kansas 1.35 1,993 757 1,061 1, 8 'i ! Arizona 1.92 3,358 19 3,212 33 1 'i. North Carolina 1.61 16,792 4,170 11,605 15.3..i..
Alabama 1.71 6,224 1,400 4,542 50940 i.
tConsiiiti orpitaties soidT i a If o sie, 6feeT proce ssin ari M lT p:rc2Ese Wy te 75.
ment under price support program, 2/ Revised. : '." marketing season comprises 12 months'in all States except Calif., which has a 14-month season .: . beginning April 1 of tne yoer shown. .'. -* zz P. .! 1 . 3 8 .: "..". .
aB u a Total a tVlseda on *2 eBgHijp. i : ^irS^^- yn109s -.*",.' -,-"- -. 52 -9_5"62"
Group a price per br. 0r." SMane. 1.00 v: 67,050. ,A 578 62,351 . -E! l!E ..STA!E------------- -_ _- _" -- -- --. gTe 1C. 2": 2 i. " Ohio 1.58 9,907 2, 124 6,985 ..
-. ... :MT.9- ... .
Kentucky 1.41 3,849 2,369 995 '! South Carolina 1.93 3,184 722 2,310 .3! SFlorida 2.30 12,484 202 12,020 .12,14! Louisiana 1.91 2,366 791 1,444 2"
Oklahoma 1.71 1,392 845 4601.
tion a for eseed tage and loss : house-. Louisiana, Oklaboma, Texas and California; and August 1 to July 31 in all other States. Permit No. 1001 N .
"P.. POW W mw . : PFNOPV-Ww. MRW"jmwpl"ll --- I .